Our Business - About Us - MICRONICS JAPAN CO.,LTD. 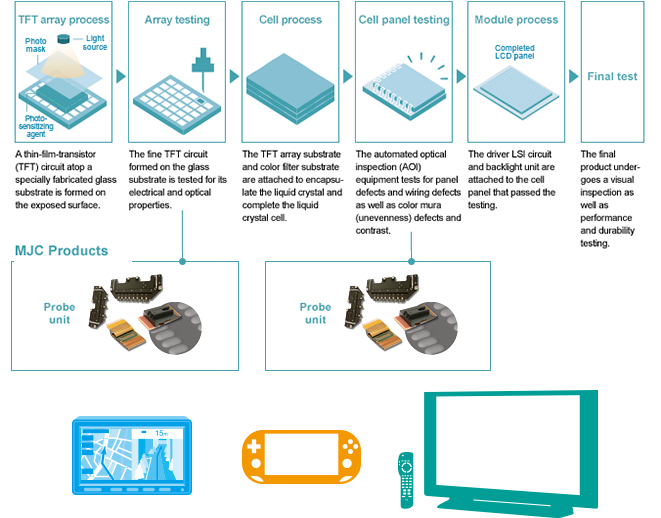 Electronic devices such as semiconductors and flat panel displays (FPDs) are the drivers of the electronics and information technology that make modern society convenient, prosperous, and enjoyable. Now, the miniaturization of semiconductors is advancing into the nano region and the range of applications for FPDs is expanding from mobile devices to in-vehicle displays and to the medical field while the shift to higher definition is accelerating. Through testing and measurement technologies, MJC supports the enhancement of quality, performance, and reliability of rapidly and continually evolving electronic devices. 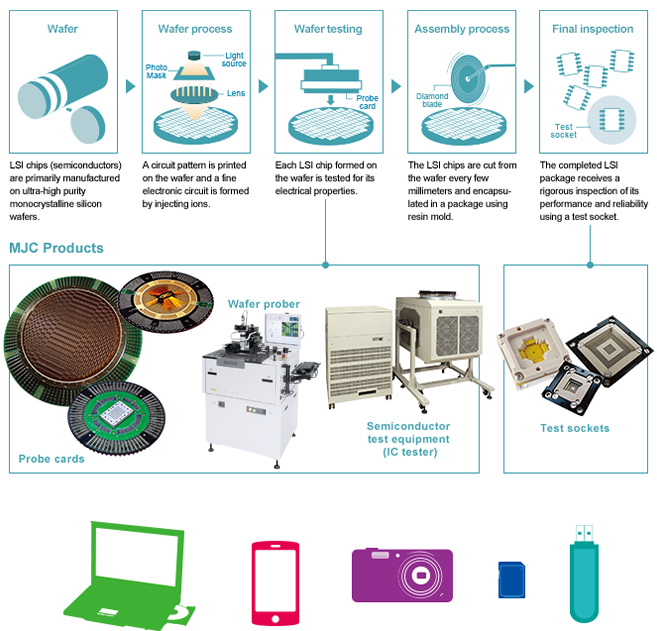 Our product lineup for the semiconductor manufacturing process includes probe cards for testing the electrical properties of wafers, testing equipment called IC testers and test sockets for property testing after packaging, as well as a wafer prober, which is used for evaluation and analysis during R&D of devices. As the functionality and diversity of semiconductors advances, we are supporting the enhancement of productivity and quality with our highly reliable testing and measurement technologies. In the FPD field we offer products such as array probers, which are used for testing the electrical properties of flat panel displays (FPDs), automated optical inspection equipment (cell/module tester) used for the display inspection of panels, and probe units that send electrical signals to test panels. As FPDs become larger with higher definition and more versatile, we are providing optimal testing solutions and contributing to productivity gains. Note:MJC has licensed technology related to array prober and cell prober products to Gallant Precision Machining Co., Ltd. (GPM) in Taiwan. Copyright© MICRONICS JAPAN CO.,LTD. All Rights Reserved.